February is always a busy month for crafters in every corner of the globe because, of course, we have Valentine's Day to celebrate on the 14th. On a personal level, it is also a month jam-packed with birthdays and celebrations for my friends and family, so I'd hoped to be much more organised than I actually am at this point. Hmmmm ... Do you detect a recurring complaint here LOL?! Not to worry ... I'm kick-starting my February crafting with this card for our Bah! Humbug! Christmas Challenge #5. "... it could be YOU!" Time restrictions has meant that my sample card is very simple this week. 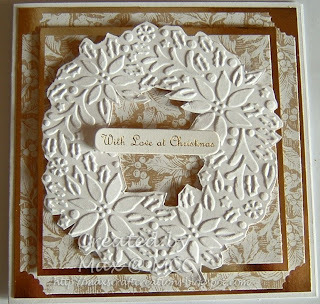 I used another of my new Cuttlebug Christmas embossing folders, (an exclusive set from Oh My Crafts), on a piece of smooth white card and then cut around the wreath with decoupage snips. This was then mounted with foam pads onto 2 layers of pretty white and gold holly background paper matted with gold mirri card. The background paper has a lovely soft pearlescent sheen which the camera is just not picking up, but trust me when I say it is quietly luxurious in real life. A greeting is placed across the centre of the wreath and that's that! No ribbons ... no gems ... no glitter ... no ink ... no colouring ... no fuss. If you'd prefer to see something more exciting, then please check out the other samples made by my "Humbugger Buddies" Ann and Irene. You won't be disappointed I can assure you. Max this is just gorgeous - I love absolutely everything about it. So classy and it may have been simple to do (don't believe you there cause it's beautifully laid out) but it's stunning. Stunning card and i love the colours!! Your card is stunning, and I LOVE, LOVE the wreath. The backing paper is so elegant, and rich. Fantastic. From one Humbugger to another - not long to go now!!!! Wow, stylish, elegant, classy, gorgeous. Can you tell I like it yet. This is just so elegant and gorgeous. Very luxurious looking too. 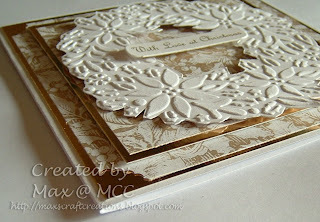 This is so elegant Max - love the embossed wreath and the soft creamy shades. Beautiful card Max ! l am trying really hard to keep up with the Bah ! Humbug! challenges.. Pop over to me when you can, as l have a little something for you..
your card is fantastic...could you pop over to mine,have something for you.